An erect, perennial herb, up to 1 m. or taller, storage stem (or corm) solid, cylindrical or spherical, up to 30 by 15 cm., usually brown, with lateral buds located above leaf scars. 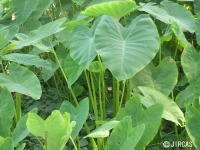 Leaves peltate consisting of long petiole and large, heart- shaped blade, 20-50 cm. long. Inflorescence a spadix, subtended by a yellow spathe, peduncle shorter than the petiole. Flower unisexual, small, sepals and petals absent; female flowers at base of spadix, green, and separated from the male flowers; spadix terminated by a sterile appendage; ovary unilocular, up to 67 ovules. Infructescence of densely packed berries. Seed less than 2 mm. long, ovate, and conspicuously ridged longitudinally. Common herb in wet place, growing naturally along canal bank from sea level to above 1,000 m. The plants thrive under full sun. Young leaf stalk is collected year round. 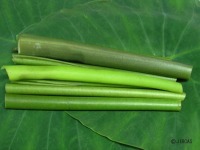 The outer skin of the stalks are peeled off before boiling with some other sour additives such as tamarind pulp. The common dish cooked with wild taro stalk is a sweet and sour curry. No planting of wild taro so far recorded in Thailand. Howerver they can be propagated by suckers and planted in muddy area. 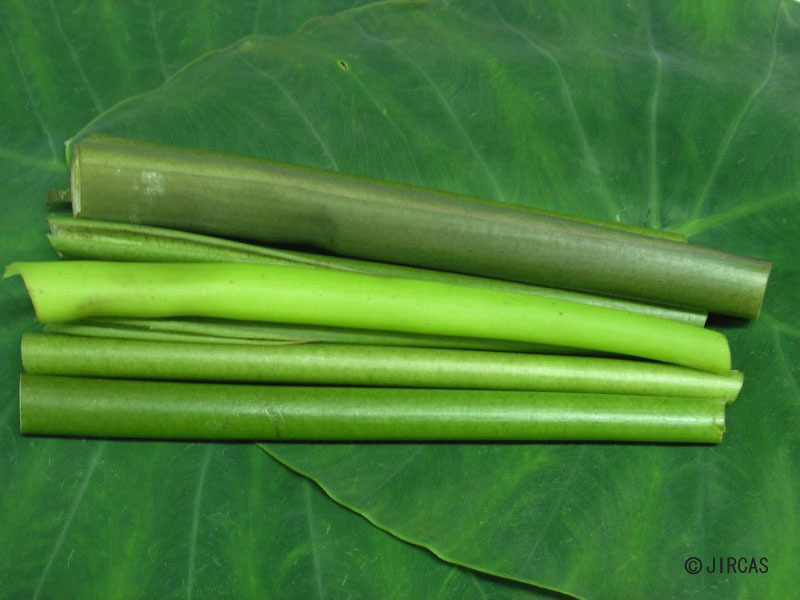 Caution : The irritated crystals of calcium oxalate are abundant in leaf stalk of wild taro. Cooking should be done carefully in order to get rid of all toxic crystals. Some less toxic selections are known among the natives.